The wait is finally over. Welcome to Circuit of The Americas for the 2015 FORMULA 1 UNITED STATES GRAND PRIX! A big event warrants a big welcome note. Bear with us, there's a lot of info below to help you get to COTA and have the best time here. With everything from schedules to food options, this is your quick reference guide to a weekend of fun. Get the most out of your USGP experience with the brand new COTA app. 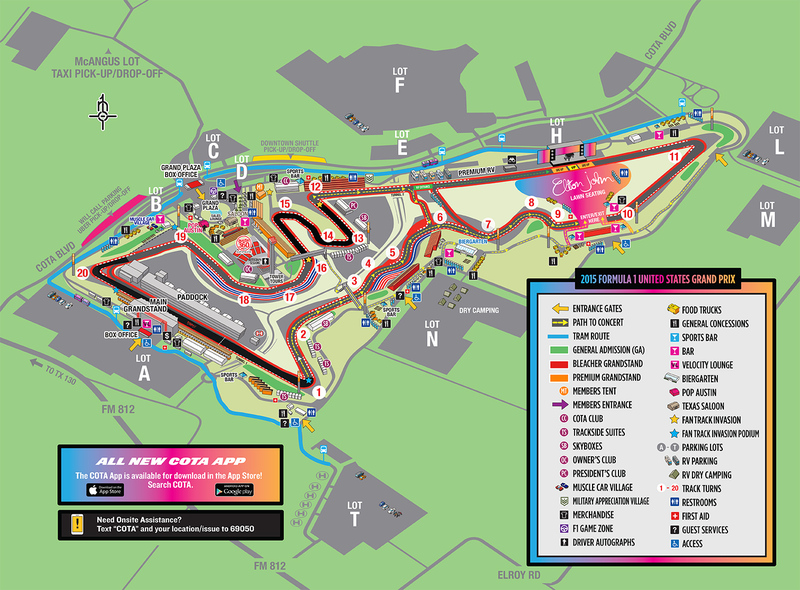 With the schedule, maps, food options and much more, it's your easy reference guide to the USGP in the palm of your hand. 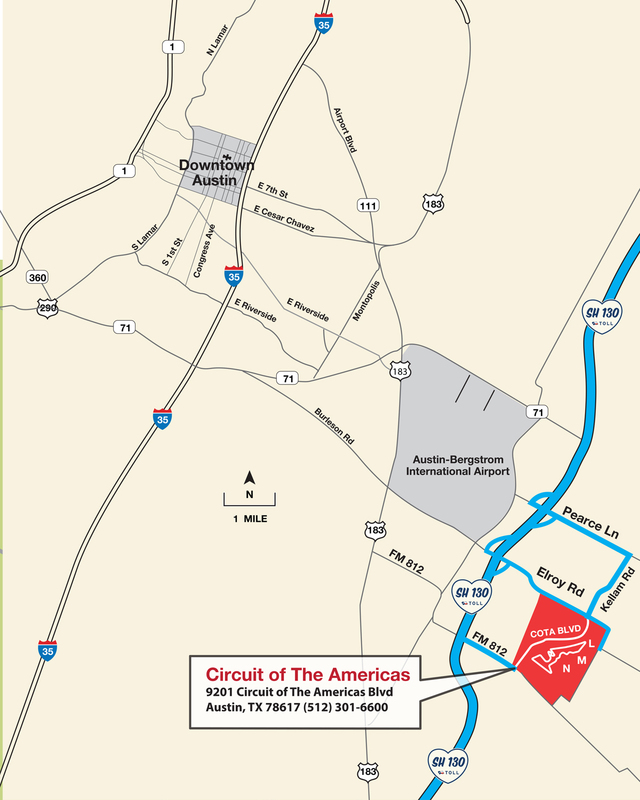 Circuit of The Americas is located at 9201 Circuit of The Americas Blvd, Austin, TX 78617. Take SH130 to FM 812. Exit at FM 812 and travel east to COTA Blvd. Take SH130 to Pearce Ln. Exit at Pearce Ln. and travel east to Kellam Rd. Turn right on Kellam Rd. and travel south to COTA Blvd. Take SH71 to Wolf Ln. Travel south on Wolf Ln for 3.5 miles to Fagerquist Rd. Turn right at Fagerquist Rd. Travel west on Fagerquist Rd for 3 miles to Elroy Rd. Turn left on Elroy Rd and ravel south to Lots L, M or N.
Take SH130 (from Austin/San Antonio/Dallas) or SH71 (from Houston/Bastrop) to SH21. Take SH21 to exit FM 812 and travel west on FM812 for 5.5 miles to Lot T.
3-Day Passes and Single-Day Passes may be purchased online, or for cash each day at COTA. FM 973 Park & Ride 3-Day Passes are available for online purchase for $30, or you may pay $20 cash per day at the lot. A $25 Express Shuttle Service is available for purchase online or for $25 cash per day at the Convention Center while supply lasts. The Express Shuttle will pick guests up at the Convention Center (corner of Trinity St and 4th St) in downtown Austin and drop guests off on COTA Blvd, across from the Grand Plaza. Getting to and from COTA is easy with Uber. Catch a safe ride and enter promo code UBER2COTA for $20 off your first ride to Circuit of The Americas. We’ve created a dedicated Uber drop-off and pick-up location directly across the street from the Grand Plaza main entrance. Download the COTA App for iPhone or Android for the most up-to-date event schedule throughout the weekend, or view it at our website. A wristband is required to take part in an autograph session, but the Q&A is open to all guests. Wristbands are distributed on a first-come, first-served basis at the Wristband Booth in the Grand Plaza. Guests will only receive a wristband for a session happening that day. Quantity is very limited. All autograph sessions will take place at our Austin360 Amphitheater, adjacent to the Grand Plaza. *Note schedule is subject to change. Download the COTA App for the most up-to-date info - iPhone App or Android App. The excitement on Sunday doesn’t begin with lights out; it starts much sooner with formal Grand Prix opening ceremonies beginning at 12:30 in the afternoon. Before taking to the track to compete, the drivers will be driven around the Circuit in vintage American cars as they are introduced to the crowd. The cheerleaders of Texas’ most successful football franchise will perform some of their most dynamic and acrobatic routines to set the tone for a day of high-octane excitement. Genesis drum line will wow fans, providing an energetic beat and unique introduction for the Dallas Cowboy Cheerleaders’ performance. Grammy-nominated neo-soul singer Mayer Hawthorne will perform the National Anthem. Enjoy an awe-inspiring flyover over the front straight of the Circuit at the end of the National Anthem. Enjoy a riveting, upbeat performance from Texas Southern University Drum Line at Turn 15 that will continue into the Grand Plaza for guests to enjoy. The Grand Plaza will be a hub of activity and entertainment during USGP weekend. Check out the Texas Saloon Bar for a full bar in a Texas-themed setting with dueling pianos and an aerial saddle performer. And be on the lookout for roaming entertainment, merchandise and much more. This satellite exhibit features an impressive collection of fine art, including pieces from Andy Warhol, Jean-Michel Basquiat, Richard Orlinski, Desire Obtain Cherish, Shane Guffogg, Micky Hoogendijk and others. You won't want to miss the POP AUSTIN track exhibit, located in the Grand Plaza and available to all race goers. Take a trip to the top of COTA's 25-story Tower to the glass-bottomed observation deck to see the stunning 360 degree view of the Circuit from a bird's-eye-view. Tower Observation Deck Tickets are offered at the base of the Tower during USGP weekend for $30 per person, or $50 per person with a VIP champagne toast at the top! Check out an interactive bubble artist, acrobatic contortionist artists and hula-hoop dancers. The popular Biergarten is back, with delicious brews and beer tastings. You can also catch an acrobatic duo doing performances throughout the weekend. Be on the lookout for a unique work of art from POP AUSTIN on your way through the Main Grandstand Suite entrance. If you'd like to double-up or even quadruple-up on sports over the weekend, swing by a Sports Bar. They'll have full bars with TVs displaying sporting events taking place throughout the weekend. Keep your eye on the statues on these bars. Some of them may be more alive than you think. Celebrate America's rich car culture with classic cars on display all weekend long. COTA has created an area dedicated to our military men and women as part of our ongoing commitment to thank them for their dedicated service to our country. Come join us Sunday morning at 11 a.m. to support new recruits as they take their Oath of Enlistment to join our Armed Forces. With everything from beloved Austin Tex-Mex to BBQ to American burgers and fries, there's a little something for every diet. Download our app (for iPhone or Android) to see a full list of food and drink vendors, as well as their locations and menus. Swing by the COTA Sales Lounge in the Grand Plaza to learn more about all the events at Circuit of The Americas, like MotoGP, X Games Austin and Vintage Racing National Championship, to name a few. You can also upgrade your weekend F1 USGP tickets here. Elton John and His Band will take to our brand new infield stage constructed between Turn 11 and Turn 12 after the race on Sunday. If you have yet to purchase a music upgrade to be closer to the stage, there are only a few remaining. 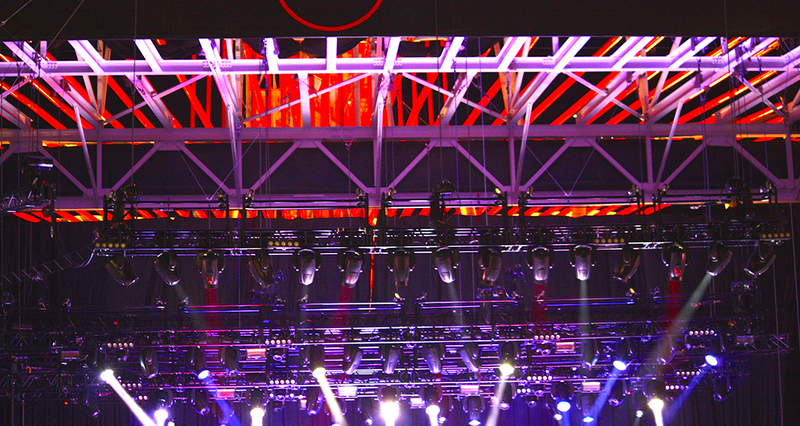 Buy your music upgrade online now if you'd like to dance the night away closer to the stage. Disability assistance carts are on standby to assist guests with disabilities. Please make a request through any event staff. ADA Services Tents will also be located outside the gates of Turn 1, Turn 4 and Turn 8. If you need assistance and do not see any staff, please contact us for a quick response via our text alert system. Text 69050 with the acronym "COTA" followed by your request or question. Our guests' safety is of the utmost importance. To view all prohibited items, please visit our F1 USGP FAQ online. If you need assistance at any point while you're at the USGP and do not see any staff nearby, please text us at 69050 with "COTA" followed by your request or question. If it's a location-based inquiry, please also include your location. Fan Forum will take place on the Bud Light Stage at the Rainey Street COTA Fan Fest location on Thursday, October 22. The forum will feature current F1 stars, including the first homegrown driver to race at Circuit of The Americas, Alexander Rossi. The drivers will answer fans' questions and sign autographs. COTA Fan Fest will take place Thursday, October 22 through Saturday, October 24. Join us each evening for a free celebration of motorsports and music in downtown Austin. Rainey Street will host the main Bud Light Stage and venues across downtown will offer an eclectic array of musical performances and activities. Go here to view all the iconic Austin venues involved. Friday: 5 p.m. - 12 a.m.
Saturday: 5 p.m. - 12 a.m.
A unique compilation of Ayrton Senna's personal effects from throughout his entire career in Formula 1 will be on display at COTA's new downtown Austin location, the Downtown Paddock, during USGP weekend. The Senna Hall of Fame Collection is one of the largest private collections in the world, and showcases items from each era of Senna's celebrated career, including his first Formula 1 test at Williams in 1983 and his final, fateful season with Williams in 1994. To learn more about this collection and view it, visit the Downtown Paddock at 304 E. Cesar Chavez Street. When you find yourself downtown experiencing all Austin has to offer, don't miss POP AUSTIN's keystone show "Illumiation." The United Nations named 2015 as the "International Year of Light." In celebration, "Illumination" will feature a number of light-based works by celebrated artists such as Carlo Bernardini, Hans Kotter, Jeongmoon Choi and others from around the world. Get more info. We look forward to seeing you very soon. Until then, stay connected with us on Twitter, Instagram and Facebook. You'll get a behind-the-scenes look at the USGP and get to interact with COTA in a unique way. And once you're here, share your experience with us on social media via #COTA and #USGP.